Ovation at Oak Tree is a new construction community in Lacey, WA. Rendering courtesy of Ovation at Oak Tree. Retirees looking for a new 55+ community within the Pacific Northwest will love Ovation at Oak Tree in Lacey, Washington. This new active adult community, which is being built by William Lyon Homes, features some of the best homes, amenities, and exciting activities that retirees seek within a relaxed and intimate setting. Ovation at Oak Tree will provide plenty of social spaces to cultivate lifelong friendships as well as places to pursue health and wellness activities for an invigorating lifestyle. William Lyon Homes began construction of this 55+ community this year and plans to build 814 single-family homes upon completion. Many of the homesites are adjacent to the Oak Preserve or open green space for natural and scenic views. Homes are priced starting in the low $300s and include front yard landscaping with irrigation maintained by the homeowners’ association. The builder offers homebuyers six distinct floor plans that range in size from 1,432 to 2,190 square feet. These detached homes offer two or three bedrooms, two or two-and-a-half bathrooms, and attached two-car garages. These single-level residences feature innovative, modern designs that appeal to active adults. Some of the highlights include energy-efficient construction, granite countertops, low-maintenance fiber cement siding, oversized garages, gourmet kitchens, hardwood flooring in kitchen, covered patios, ten-foot ceilings, tile countertops in bathrooms, and spacious master suites with walk-in closets. Not only will Ovation at Oak Tree offer beautiful and low-maintenance home designs, it will also provide an impeccable lineup of resort-style amenities that cater to an active and social lifestyle. This active adult community will host two private amenity-rich clubhouses that are currently being built. The Pavilion, which will open in late 2017, will offer 4,500 square feet of social and recreational space. 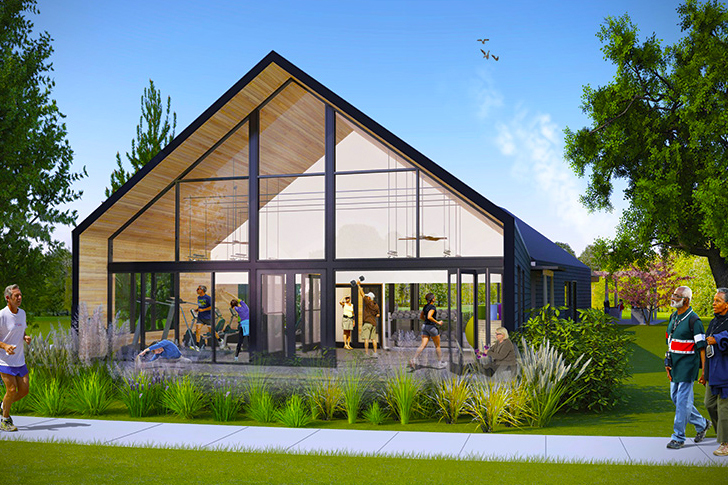 The Pavilion will include a living room, entertainment kitchen, exercise studio with equipment, changing rooms and lockers, patio with outdoor kitchen, and community fire ring. The Village Club, which is scheduled to open in winter of 2018, will offer 13,000 square feet of community space and will be the crown jewel of Ovation at Oak Tree. The Village Club will feature a living room with lounge seating, game room, gathering hall with entertainment kitchen, yoga and dance studio, fitness studio, separate locker rooms, heated indoor pool, sun deck with lounge chairs, covered patio with outdoor kitchen, community fire ring, and outdoor sports courts. Residents will also be able to enjoy the community’s scenic outdoor environment thanks to its birdwatching area, 40-acre nature preserve, and miles of walking and biking trails. With so many amenities spread throughout the community, homeowners will never have a dull moment. They can easily build lifelong friendships with neighbors at either clubhouse or explore a new hobby or activity to live a fully engaged lifestyle. From swimming and biking to birdwatching and yoga, no matter what they choose to do, residents will enjoy an active and healthy lifestyle in Ovation at Oak Tree. Located just 20 minutes east of downtown Olympia, Washington, Ovation at Oak Tree has everything active adults could want or need within this tranquil setting. This age-restricted community provides an intimate and natural environment thanks to nearby parks like Heritage Park and Capitol Lake Park. Daily conveniences are also nearby, including Capital Mall that’s just 20 minutes away and includes more than 90 restaurants and retailers. Closer to home, residents are minutes away from a Safeway, Costco, Walmart Superstore, and Winco Foods for everyday necessities as well as Providence St. Peter Hospital for all of their medical needs. Easy access to Interstate 5 allows retirees to get around town quickly. When traveling farther, Olympia Regional Airport can be reached in about 20 minutes. With so many great things inside as well as outside of this 55-plus community, retirees are sure to flock to Ovation at Oak Tree in Lacey, WA for their ideal retirement destination.